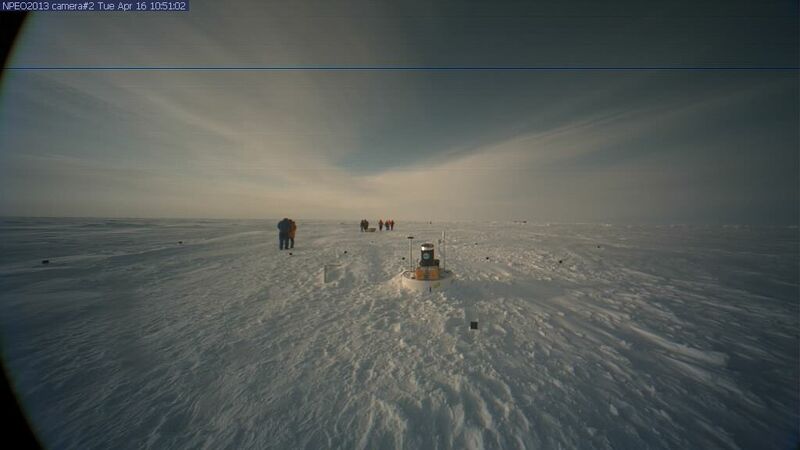 Significant dropping horizon near the North Pole. Cam1 has no such great drop of horizon, that is better, no ridging means that there are fewer recent leads near by. It represents the majority of ice surface about the Pole. when the sun is much further up in elevation. 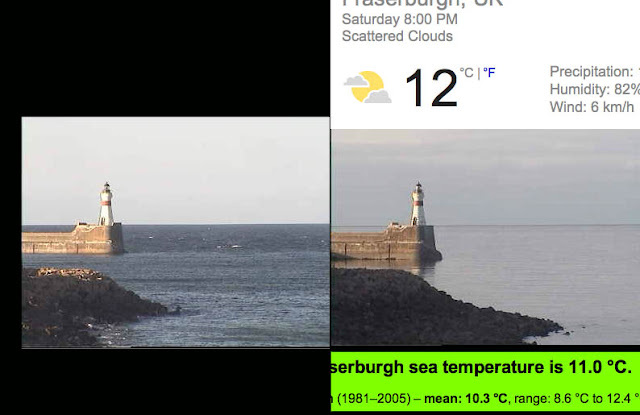 Higher resolution upgrade of either the camera or photo processing would show a shifting horizon. But since we have none, implies we must wait until the sun rises a further 5 or 6 degrees before it shows. measurement is difficult. The snow nodules got drifted over, and it has been very cloudy and foggy near the pole, this slows the melt progress quite a lot. 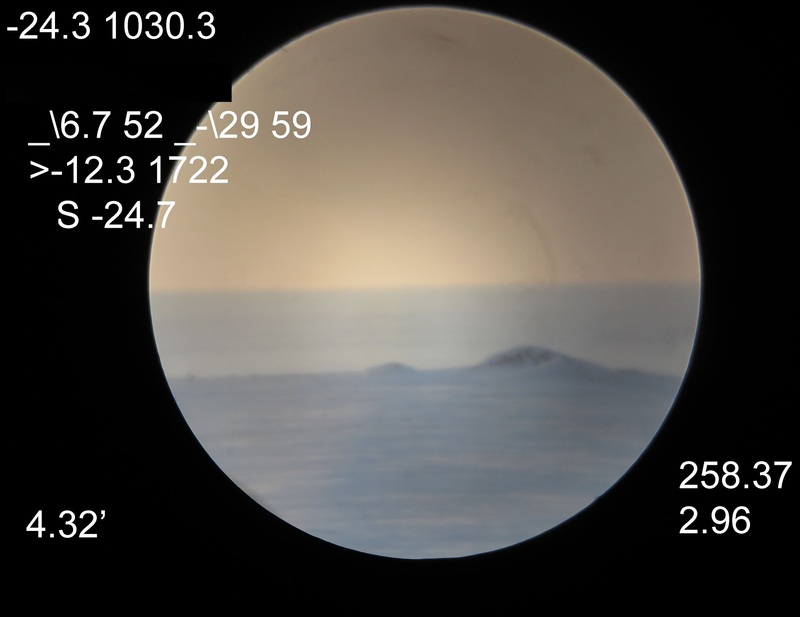 near North Pole horizon shows up significantly lower when sun is 10 degrees higher. ~ Pre paper basics presentation. Unlike surface water, sea ice has rapid thermal variation characteristics which enables an instant evaluation of its thickness and age. Apparent high Arctic sunset disappears in mid air. That was not so. The sunset was much raised with the ice horizon. By 11 arc minutes. The horizon was higher, the entire sun disk transforms in turn. From ovoid to becoming saucer like, eventually morphing to a sun line which was highly compressed sun disk image. 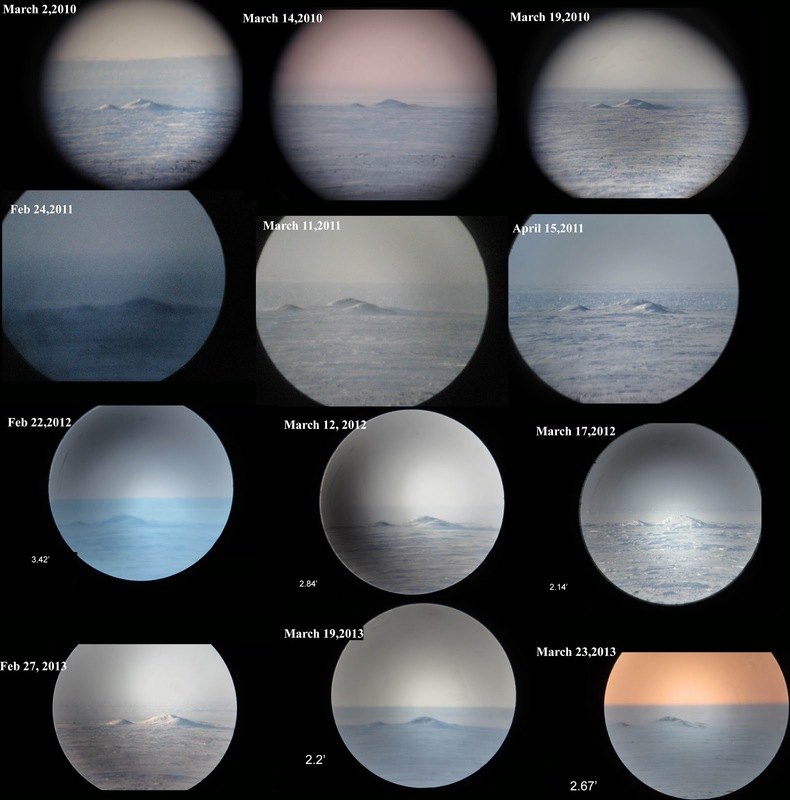 Arctic haze, more common then, masked the raised ice horizon. At the time, sea ice over the NW passage was a mix of old and new. Multi-year ice made the onset of freeze-up earlier in autumn 2003. The end result was thicker ice many months later in March when this sequence was taken. layer by layer, making the sun's upper limb wearing a green flash hat, or at the end revealing gravity waves streaming. Fortunately sun disk effects are much more complicated than the rising horizon. There is so much air thickness between sun and camera which absolutely demands a greater knowledge of great chunks of the atmosphere. Inspiration to study something apparently simpler came about. To make sense of all these mirages a steadier subject was needed. Elevation wise, sea ice varies throughout the day. Can be studied at any time for days especially with good visibility. From this visual aspect, using a baseline value for sea horizon height having water and surface air with the same temperature, a retrospect evaluation of sea ice thickness is possible. 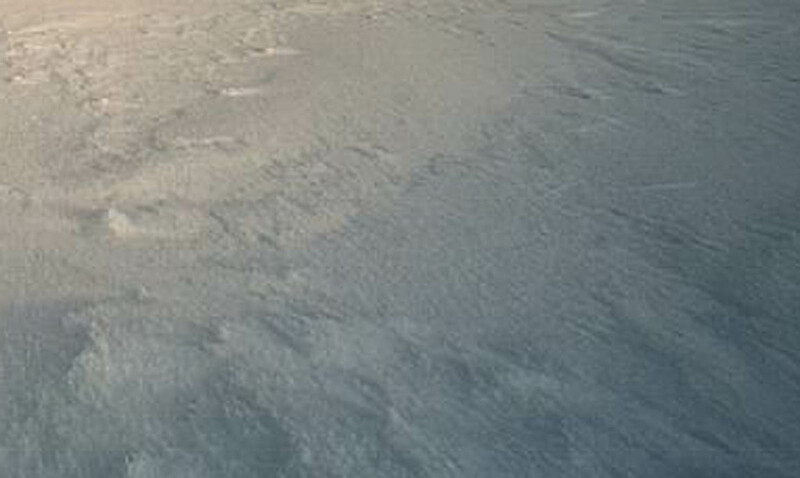 On this March 2004 day, there was likely a sea ice mean thickness of 3.2 meters over a huge area of the NW passage. Long wave radiation has a way to be revealed, if a body emits a great deal of it, the immediate area adjoined will be warmed. In the case of sea ice, sun rays heats sea ice surface, but warming comes from below as well, Arctic sea surface temperatures are almost always higher than air during winter, this continuously tends to soften the ice bottom making it become brittle or fragile. If the sun is strong enough, the sea ice to air interface looses its boundary layer, or structure. September 2012 Sea surface temperature (devoid of ice) is equal to the surface air, the horizon is at steady state, it appears at pure astronomical horizon elevation. If the Horizon goes below this level, there is an inferior mirage, the water or ice is warmer than the air. If it rises above, there is an inversion, when so water or sea ice surface is colder than the air. March 19, 2013, seemingly cold -26 C day. 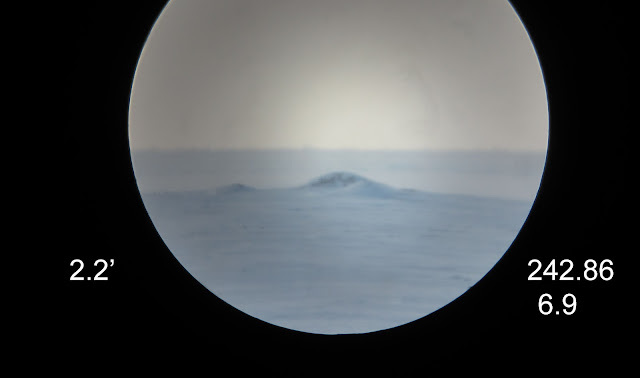 The ice horizon was lower than the steady state, the ice is not getting bigger at this moment, more likely melting from the bottom, warm surface sea ice nullifies the inversion above which was keeping the cold air locked, and creates an inferior mirage, similar to road mirage. Same day but later , the sun is 3 degrees above the horizon, ready to set. Ever since last picture was taken, the horizon rose in small increments, will continue to do so. 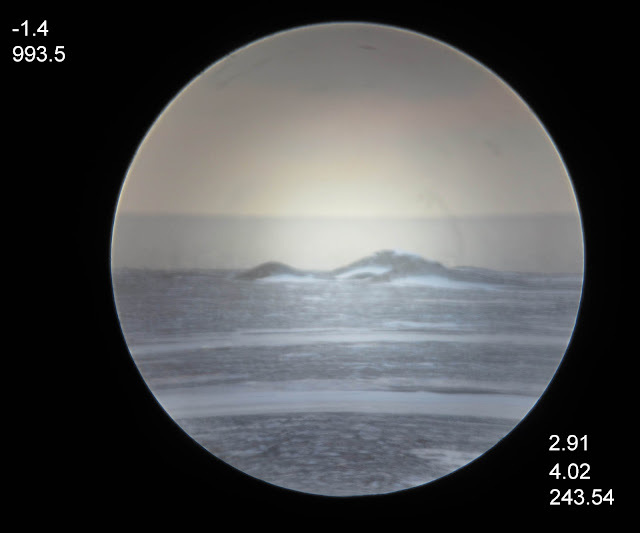 The steady state astronomical horizon line was exceeded higher, sea ice was thickening. The cold air overtook the heat gained by the sun, there is a net heat lost by the ice. 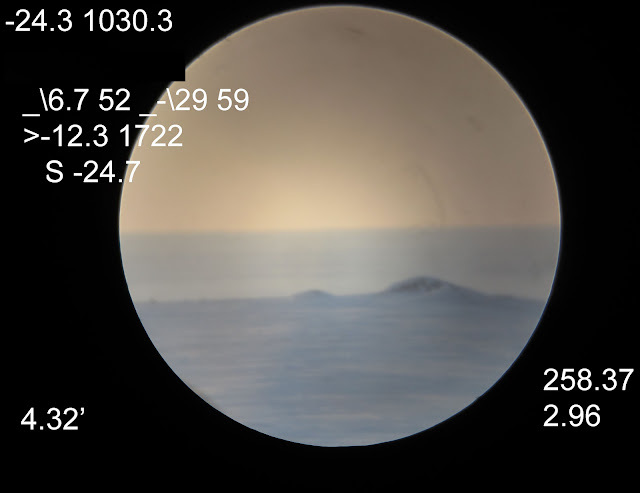 The apparent horizon gain gives away the over all thickness of the sea ice. As a general rule, the thicker the ice, the quicker the horizon rise. From minima day onwards the first onset of thinnest ice, clear sky horizon rose in tandem with ice thickness. One basic empirical rule is 50 cm per minute of arc increase. In this picture above, it means 160 cm overall ice. 255 cm less than compared to 2004 sunset sequence at about the same date. This method applies for any horizon, including Redondo beach L.A.
Really obvious drop at right april 24. 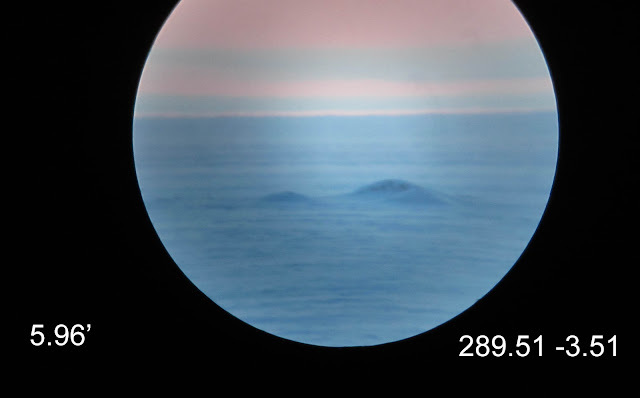 Unusual, with sea surface 16C with surface air 16 C. Could be a fog bank on the right picture or the true astronomical horizon. Must observe further.